A month after I started my "Scrap Buster" quilt, I am still feeling seriously out of my element and comfort zone, but I am enjoying the process with a surprising amount of enthusiasm. To date, there are 34 completed blocks. At the outset of this project, I set 3 goals for myself. 1. Use up scraps and reduce the stash. 2. Allow myself freedom to play and experiment with improv quilting. 3. Make a block a day within a 30 minute time limit. How am I doing re: scrap busting? 1. Only scraps and remnants have been used to this point. In order not to create even more waste, I have been trying to use the pre-cut shapes and pieces as they are, with as little trimming as possible. When a piece needs to be re-cut, I try to cut it in such a way that the off-cut can still be used somewhere else. Many of the scraps are 2 1/2" strip lengths left over from previous projects. Sometimes I can use the whole width to re-cut another shape. 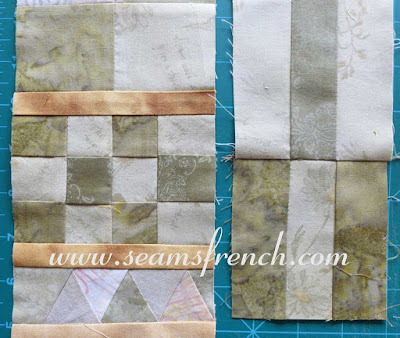 But because I am using 1" strips as sashing between the pieces in the rectangular blocks, I need a lot of strips cut into 1" wide lengths leaving a lot of 1 1/2" wide lengths left-over. 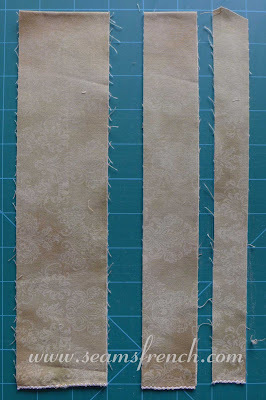 A 2 1/2" strip has been re-cut into 2 lengths: 1" wide and 1 1/2"wide. The majority of the blocks are 4 1/2" x 10 1/2", and to give them a little more definition and consistency, I am separating the pieces with the 1" strips of sashing (1/2" finished). 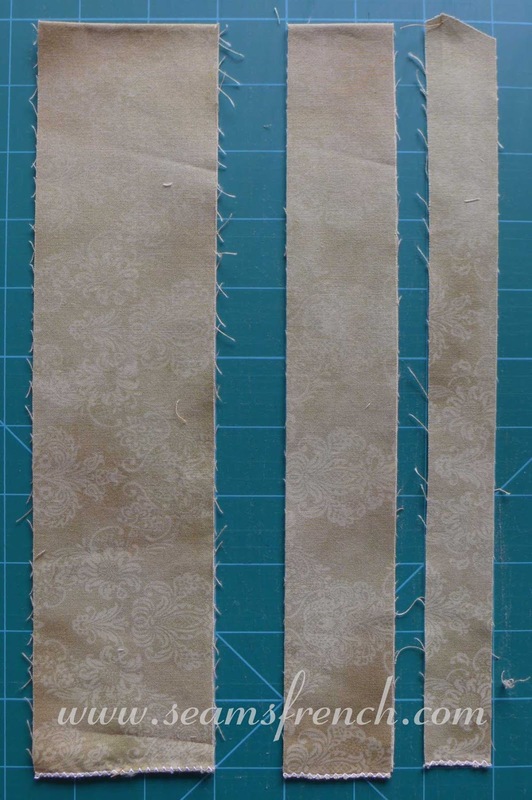 1/2" finished strips of sashing have been set between the pieces. But that created the problem of what to do with all of the left over 1 1/2 " strips. When I stitched these together into a basic 9 patch, and added an additional row, they were the perfect fit for the 4 1/2" wide block. Voila! The 3 rows of 1" squares were made with the 1 1/2" strips. The paper pieced triangles on the bottom left are pre-pieced remnants from a prior project. 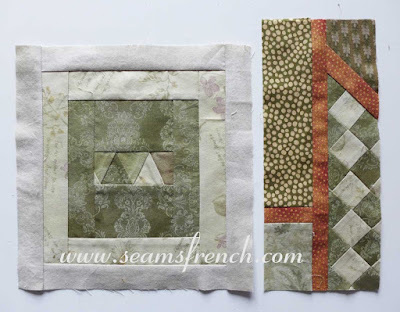 After completing 34 blocks using only fabrics from the scrap bag, there has not been a significant reduction in the scrap stash, but it's a start. No fear of running out of scraps any time too soon! 2. How am I doing re: the "improv" thing? I'm not familiar or comfortable enough with the term to know if it applies. Mine is more of an experiment with scrap quilting; making it work with only what you've got, like our grandmothers used to do. Monica over at Lakeview Stitching describes the process very well. She uses the term "organic" to describe the technique; letting the materials at hand determine the design. I like that term and feel it could apply to my little experiment. 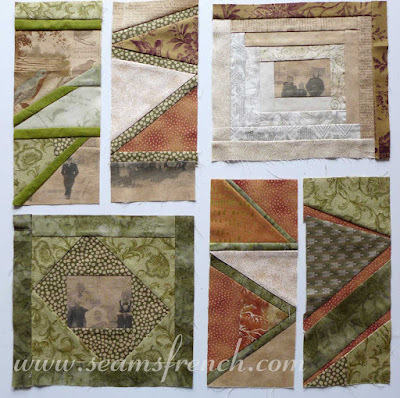 My scrap quilt feels chaotic and out of my control, where as Monica has reigned in the chaos and is creating a well balanced order from the disorder of the fabrics at hand. 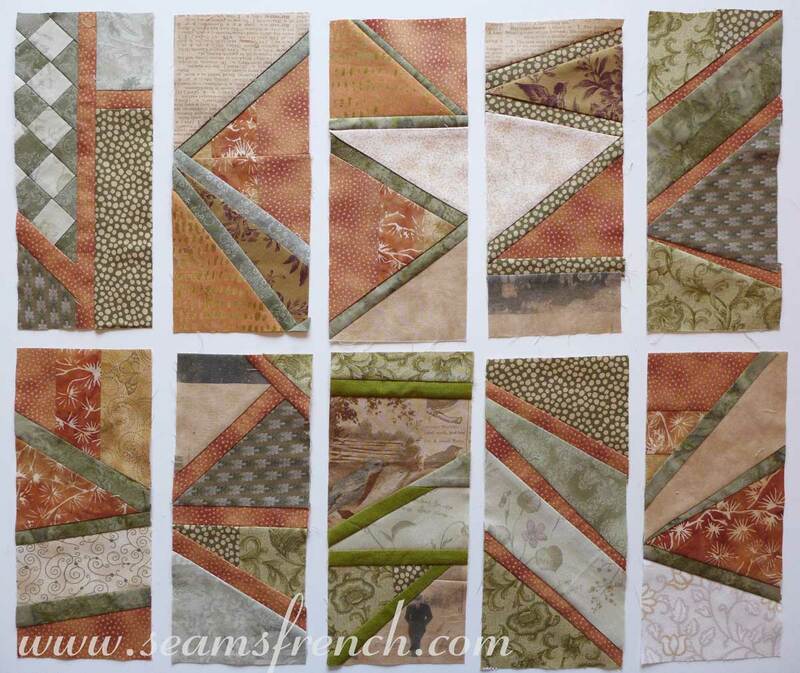 Check out here quilt here. In my quilt, two types of blocks seem to be developing: an 8 1/2" x 8 1/2" square block, and a 4 1/2" x 10 1/2" rectangular block. Other then the log cabin block with the photo, upper right hand corner, most of the pieces below were used with minimal, if any, re-cutting. Trying to make a more consistent, traditional log cabin block created too much waste and completely defeated the point of this exercise. In the photo block at the bottom left, the pieces were used basically as they had been cut, with only minimal time and trimming required and I quite prefer that block anyway. For every square block, I am making 2 rectangular blocks. 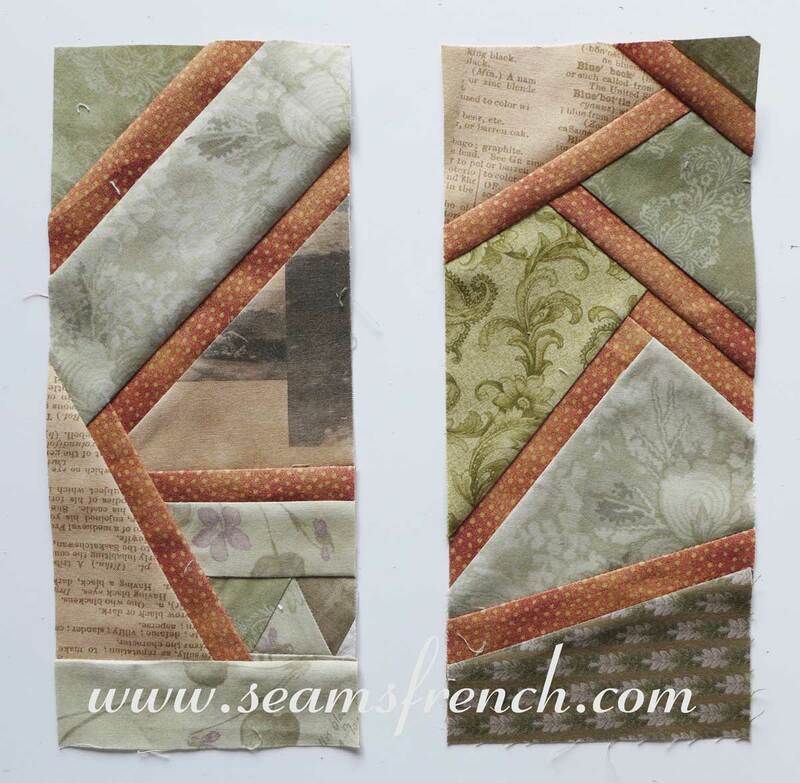 More examples of blocks that just sort of fell into place with little recutting. In the scrap bag, there are a number of pre-pieced remnants from previous projects. These are examples of how I work them in. Playing with colour. 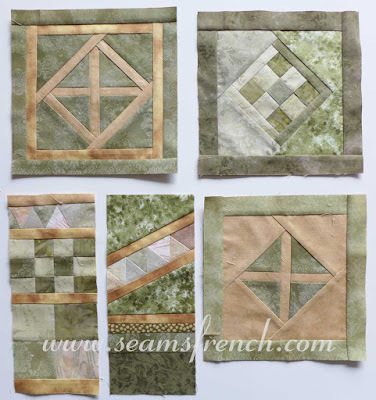 I like the monochromatic greens in these blocks with a more subtle sashing. At this point I find that the more thought that goes into the block and the more I try to compose it, the less happy I am with the outcome. Just letting it happen seems to be faster with more successful results. We'll work on the "chaos thing". 3. How is the 30 minute per day time plan going? So far, it just ain't happening! Because set up itself takes a while, instead of spending 30 minutes every day, I take half a day several times a week to get in my quota of 7 blocks per week. I also have to admit that stopping myself has become a bit of a problem. It seems I get into a bit of a frenzy looking for just one last piece, and then let's see how it would look next to that other piece over there. And while we're at it, let's just stitch them together. It's a tad addictive. And fun! Who knew? You are doing great! I am very happy to have inspired you. You are right that it is best to suspend judgment until all the blocks are done. Then you can worry about composing them! Onwards! This quilt may be a complete disaster, but I'm enjoying the process. So it's "yoiks and away"!